The mural is the first thing you notice at Z Zoul in the Tenderloin. On the back wall, a pensive woman enfolded in a flowing blue dress sews together a swatch of green fabric that has been ripped in two. An Arabic phrase, repeated in both faint and bold lettering, hovers around her like a swarm of moths. 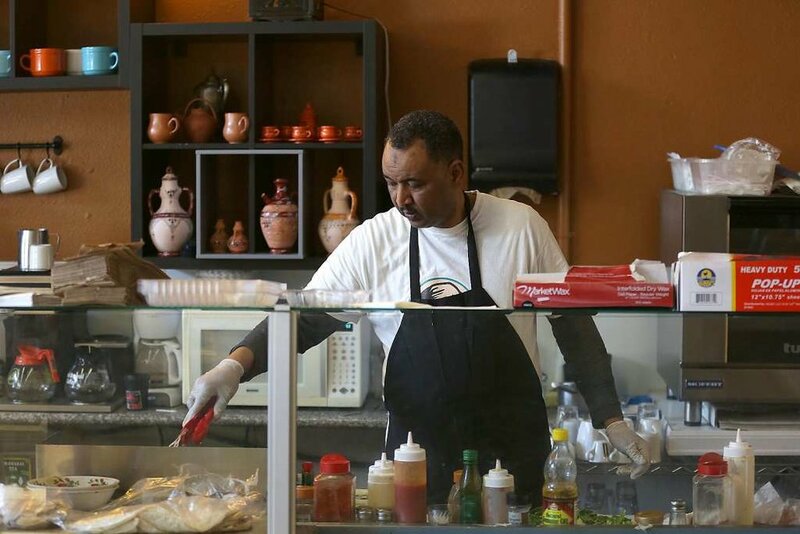 Once owner Aref Elgaali explains its meaning, the mural leaves the restaurant with you, too. The woman, who resembles Elgaali’s mother but is not her, is mending a map of his birth country, Sudan, from which South Sudan seceded seven years ago. The phrase translates as “All are one.” The mural is a prayer for unity, one the refugee spends his days contemplating from behind the counter. Read the full story by SF Chronicle writer Johnathan Kauffman here.